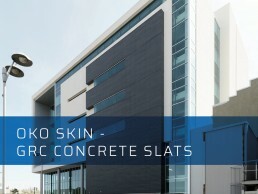 What are Oko Skin GRC Slats? 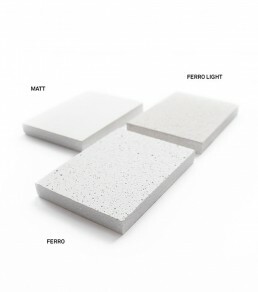 Made from a mix of natural concrete and glass fibre, and moulded in to planks, this clever material, allows you to create a natural looking façade with a contemporary look. Oko Skin textured slats are strong, yet still only 13mm thick, and are incredibly durable in the face of the elements, and, as they manufactured from glass reinforced concrete they are non-combustible. The benefits of using Oko Skin Slats are that they are sustainable, durable, non-combustible, easy to install and come with a range of fixing options. OKO SKIN SLATS ARE AVAILABLE IN 3 SIZES, & CAN EASILY BE CUT & DRILLED ONSITE. WHY USE OKO SKIN SLATS? Each Oko Skin pack comes with both textured and smooth planks, allows you to create a façade with texture and subtle colour differences, giving you that all important contemporary look. The Oko Skin plank range comes in a variety of 12 colours to suit any design & project.